Although some information has been obtained from expression studies and biochemical analysis of the RLKs , genetic approaches have provided the most information about the roles of the LRR RLKs in cellular communication. Of particular significance for this review is the fact that the functions of only five Arabidopsis RLKs have been described, all of which encode LRR RLKs. These Arabidopsis RLKs of known function include ERECTA (ER), CLAVATA 1 (CLV1), HAESA (HAE), BRASSINOSTEROID-INSENSITIVE 1 (BRI1), and FLAGELLIN SENSING 2 (FLS2). The er mutant plants have a compact inflorescence, with shorter, blunt fruits and round leaves. The er phenotype is expressed throughout much of the plant's life , and the common developmental pattern observed among affected organs suggests that er controls cell expansion. ER kinase assays show that this RLK, like all of the LRR RLKs examined to date, is a serine/threonine protein kinase . Numerous er alleles have been identified, and phenotypic variation among alleles suggests both the extracellular domain and the protein kinase domains are critical for function. Essentially all mutants that have been identified have a strong er phenotype very similar to that observed in an er-null plant . 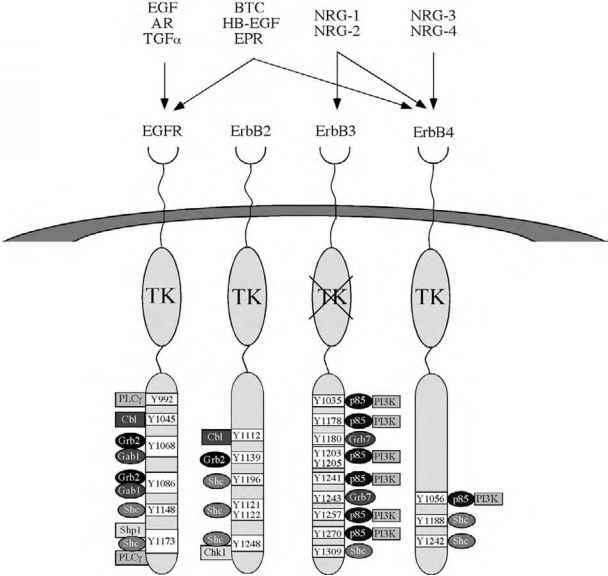 Although little is known about other components of an ER signaling pathway, the recent identification of a mutation in a putative heterotrimeric G-protein p subunit gene (agbl) that has some phenotypic similarities with er suggests a connection between LRR RLK and GPCR signaling . This connection is supported by an analysis of agbl-er double mutants that indicates these two genes may function in a common developmental pathway that controls fruit shape; however, a biochemical connection between abgl and er has not been established. CLV1 is thought to promote differentiation of cells in shoot and floral meristems. Many alleles of CLV1 accumulate undifferentiated cells in the meristem of the Arabidopsis shoot. 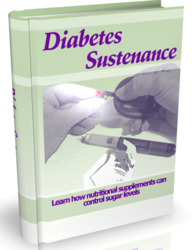 This leads to the formation of enlarged shoot and floral meristems, fasciated stems, extra floral organs, and fruit with extra cells at the tip, which give these fruits their characteristic club-like appearance . Biochemical and genetic analyses of CLV1 have led to the identification of several other proteins that may mediate CLV1 signaling. Size exclusion chromatography of immunoprecipitated CLV1 from plant extracts indicates that CLV1 is part of a multimeric complex , which is consistent with genetic data on dominant interference of some mutant alleles . Analysis of the CLV1 complex has also led to the identification of an associated Rho-like GTPase and the type 2C protein phos-phatase KAPP (kinase-associated protein phosphatase). Small G proteins have well-established roles in many signaling cascades , but their relevance to plant signal transduction is uncertain. KAPP was initially identified as a protein that binds several RLKs [13,14] in a phosphorylation-dependent manner via a fork head-associated domain . Overexpression of KAPP in a wild-type background caused a weak clv phenotype , and cosuppression-based loss of KAPP expression in a clvl background suppresses the clv phenotype . These results suggest a role for KAPP as a negative regulator of CLV1 signaling. Another partner for CLV1 is the CLV2 protein. clv2 is the second of three mutants that express the clv phenotype. CLV2 encodes a transmembrane LRR protein with a short cytoplasmic domain but lacks the protein kinase domain found in CLV1 . Analysis of protein extracts prepared from clv2 mutants shows an overall reduction of CLV1 protein and a shift in the distribution of CLV1 from the wildtype high-molecular-weight complex to a lower molecular weight complex . Because CLV2 has no protein kinase domain or other identifiable enzymatic function, CLV2 may be required to form stable CLV1 signaling complexes. A third mutant gene, clv3, shares many of the same traits expressed by clvl mutants, and genetic analyses of clv1-clv3 double mutants place these genes in the same pathway . CLV3 is predicted to encode a small secreted polypeptide  and is a member of a large family of genes that are putative secreted signaling peptides in plants . Two lines of evidence support the role of CLV3 as a ligand for CLV1. CLV3 has been shown to be required for the formation of an active CLV1 signaling complex, and CLV3 will bind to yeast cells expressing CLV1 and CLV2 . HAESA is an LRR receptor protein kinase that belongs to the same family as CLV1 , yet it appears to have a very different function. Like CLV1, HAE is a transmembrane serine/threonine protein kinase located in the plasma membrane . HAE is expressed in abscission zones of floral organs, as well as at the base of petioles and pedicels. Expression in flowers is stage dependent and first observed in maturing flowers, coinciding with competence to self-pollinate. Transgenic plants expressing a constitutive antisense HAE construct have defective floral organ abscission, which suggests HAE plays a role in abscission . Figure 1 Model for BRI1 signaling. A putative steroid binding protein (SBP) is processed by BRS1, a secreted serine carboxypeptidase. Activated SBP binds brassinolide (BL) and the ligand complex then can interact with BRI1. Upon binding, the BRI1 protein kinase is activated and stimulates the activity of BAK1, a co-receptor, which can further trigger a phosphorylation cascade. Both KAPP and BIN2 are negative regulators in the BRIl-mediated signaling pathway. BES1 is a potential transcription factor that is substrate of BIN2. A direct connection between BIN2 and BRI1/BAK1 is still unclear. binding to transcription factors in the cytoplasm or nucleus, resulting in a change in gene expression . Evidence supporting the role of BRIl in brassinosteroid signaling includes the observation that a chimeric receptor containing the LRR domain of BRIl and the protein kinase domain of XA21 (an LRR RLK from rice that functions in disease resistance) triggers defense responses when treated with brassinosteroids . 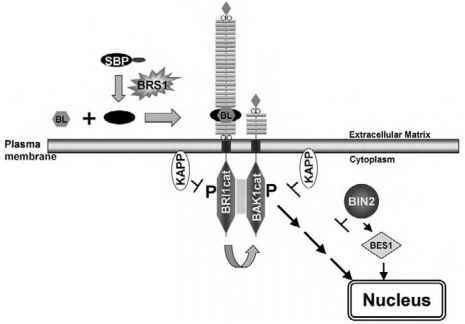 In addition, brassinosteroids stimulate BRIl autophosphorylation in plants and bind to immunopre-cipitated BRI1 . Thus, a combination of genetic and biochemical analyses show the LRR receptor BRIl is a critical element in steroid hormone signaling in Arabidopsis (Fig. 1). Recent genetic screens have revealed additional components of brassinosteroid signaling, BIN2 and BRS1. Plants with mutant alleles of BRASSINOSTEROID-INSENSITIVE 2 (BIN2) are semidominant dwarfs with phenotypes similar to BRI1. BIN2 encodes a GSK2/SHAGGY-like protein kinase and when overexpressed BIN2 interferes with BRI1 signaling . This suggests that BIN2 is a negative regulator of brassinosteroid signaling. bri1 SUPPRESSOR 1 (BRS1) encodes a carboxypeptidase that was identified in an activation tagging screen of a weak bri1 allele . Overexpression of BRS1 suppresses the bri1 phenotype and results in increased growth. BRS1 is predicted to be a secreted type II carboxypeptidase, and overexpression of BRS1 suppresses two different weak alleles of bri1 that have extracellular domain lesions, but not a bri1 allele with a mutation in the protein kinase domain. Thus, BRS1 is thought to be involved in proteolytic processing of a protein involved in an early step in BRI1 signaling. Peptides derived from flagellin, a bacterial flagellar protein, activate plant defense responses, such as callose deposition, production of reactive oxygen species, and induction of pathogenesis-related gene expression in many plants. In Arabidopsis, flagellin peptides also alter growth of seedlings. Using this altered growth response as a screen, flagellin-insenstive plants have been identified. One of these, FLS2, encodes a LRR receptor protein kinase , and a fls2 allele with an extracellular domain mutation does not bind fla-gellin . FLS2 is related to two other plant disease resistance genes, XA21 from rice and Cf9 from tomato . As described above, XA21 is a LRR receptor that has a protein kinase domain, while Cf9 is similar to CLV2 because it is an LRR receptor with a short cytoplasmic domain and no protein kinase domain .